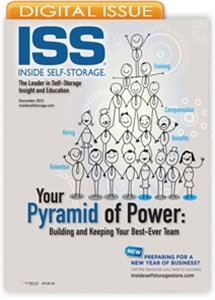 The ISS December 2013 issue explores important issues of self-storage staffing, with articles on hiring, employee retention, evaluations, training, manager bonuses and more. Self-storage is a customer-centric business, with the manager at the heart of it all. Great managers will keep a well-performing facility at the top of its game or turn a floundering operation into a successful one. But they can’t do it alone. Employees need support from ownership including training, incentives and feedback on their performance. The December issue explores staffing from a number of angles with articles on hiring, employee retention, evaluations, training, bonuses and more.